I painted the background with distress inks, and colored the adorable mermaid and fish with Copic markers. Supplies: Stamps – Lawn Fawn, My Favorite Things, paper – Canson watercolor, Neenah Classic Crest Solar White, Stampin’ Up! Basic Black, inks – Copic BG15, BV00, E15, E19, E51, E57, V04, YR68, Tim Holtz/Ranger Distress Inks Blueprint Sketch, Peacock Feathers, Wilted Violet, VersaFine Onyx Black, dies – Lawn Fawn (stitched rectangle), My Favorite Things (fish, mermaid), embossing powder – Ranger Super Fine Detail clear. 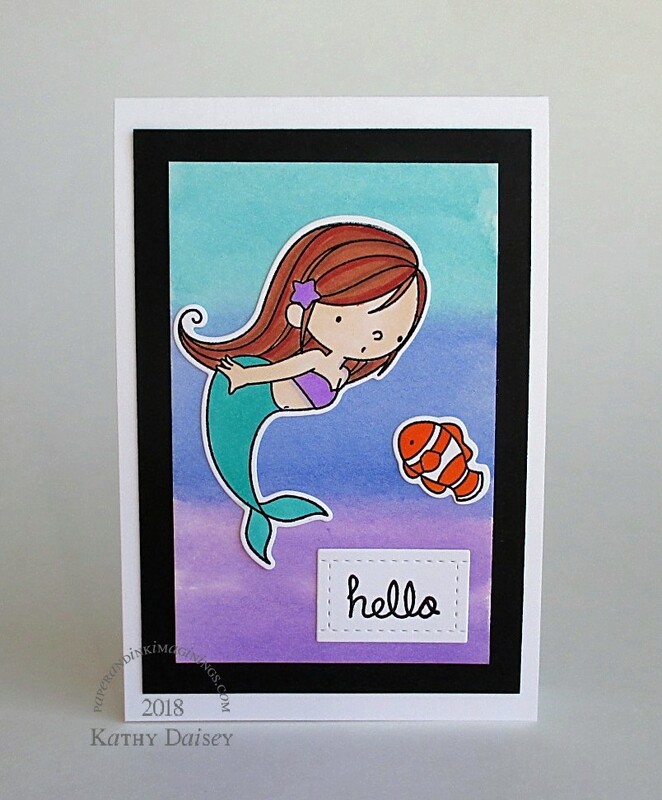 Categories: card, hello, note | Tags: Canson, card, Copics, Lawn Fawn, My Favorite Things, Neenah, Ranger, Stampin' Up!, Tim Holtz, Tsukineko, VersaFine | Permalink. Really cute Kathy. Having been an elementary school teacher for over 20 this reminds me of Disney films.